I really feel sorry for the crabs in this situation. Wow, a surprisingly good Master System cover. Plenty of games bore me, frustrate me, annoy me, but there’s something about Spy Vs. Spy‘s limited, tedious gameplay that sends me into a Trent Reznor-certified downward spiral. It happened with the NES version, and it’s happened with this Master System version. You play as a white-coated spy searching for five items in a series of dimly lit rooms. The items include a key, a passport, cash, documents, and a briefcase. The briefcase is the most important item: without it, you can only hold one item at a time. Once you collect all of the items, find the airport (signified by a door with two airplanes) and jet away to the next series of rooms. Your enemy, the black-coated spy, is looking for the same items. The game always starts the two spies in the same room, leaving you one of two options: pound the crap out of the other spy until he dies; or run away and begin searching for the items immediately. The screen is split up into two sections, with the top half monitoring your actions and the bottom half monitoring the actions of Mr. Black Coat. While you’ll mostly be focusing on your spy, it’s good to be able to see what the other one is up to, especially if he’s laying down traps. Both spies have access to traps – bombs, springs, guns, etc. – that can be set in strategic areas in each room. Should a spy trigger a trap, they’ll die immediately and have to wait about ten seconds before they’re regenerated. During this time, the dead spy’s half of the screen turns black, and the living spy can rob them of their stuff, if they search the room where the spy was killed. That’s Spy Vs. Spy in a nutshell, but let me guide you through a stage, perhaps one of the earlier ones so we don’t get lost (later levels have an insane amount of rooms scattered among several floors). Both spies start off in the same room. Unless you want to take out the enemy spy immediately, walk away to a different room, then check your map. Any room on your map with a dot on it has an item. Go to a dotted room, find the item, but remember, you can only hold that one item until you find the briefcase. Let’s say you collect two items, cash and a key in that order, but you do not have the briefcase. The black-coated spy can enter a room and steal the key you just picked up, even though the key appears in your item collection screen. I hate this and it happens all the time. Doesn’t the black spy kinda look like a rabbi? Let’s say you collect a briefcase with every item and you’re off to the airport. You open the airport door and are greeted by a thug who punches you against the wall, killing you. The thug was not placed there as a trap by the black spy, he’s completely the game’s doing. In the meantime, while your screen is black and you can’t do anything, the other spy comes along, steals the briefcase, and walks out the same door where the thug is no longer there. Complete and utter bull crap. How are you supposed to know that there’s a brute behind the airport door that can kill you if you open it? You don’t, it’s a chance you have to take because you need to complete the level to progress. I hate this and it happens all the time. The white spy pleas for death from beyond the game. Some cheapness aside, every feature of Spy Vs. Spy works – the traps, the collecting of items, taking down the other spy – assuming you like the style of play being offered to you. I don’t. I hate searching for the items. I hate searching for the briefcase to be able to hold all of the items. I hate the convoluted stage layouts past stage 3. I hate the time limit. I hate getting caught in a trap. I hate setting traps. The only aspect of this game that gives me any sense of release is punching/kicking the other spy until his ghost floats up to heaven. Everything beyond the brawling is unwanted tension and anxiety that increases with each passing level. Every level is the same tired trap-and-collect shenanigans, repeated over and over with an increasing amount of rooms that are frustrating to navigate, despite the presence of a map. 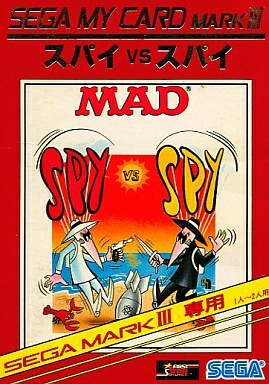 If I never encounter Spy Vs. Spy again on some other chrono-gaming journey, it will be too soon. I’ve heard that two-player is the way to go with this one, but after wrestling with the one-player for awhile, I was spent. I can remember this being well thought of back in the day on the 8-bit home computers I believe on those it even spawned a number of sequels. Like yourself though I just didn’t like the game, I haven’t played the Master System version just the Speccy one but it sounds identically annoying. There’s actually two sequels for computers, which blew my mind. Dude, you’ve never played Spy Vs. Spy? You need to get on that! Forget everything you just read, it’s fantastic. Was this the only licensed Mad Magazine based game? I guess the world world wasn’t ready for the wacky adventures of Alfred E Neuman and Kaputnik in 8 and 16 bit. I believe it was. Better to experiment and leave well enough alone than to ruin all of MAD’s creations.